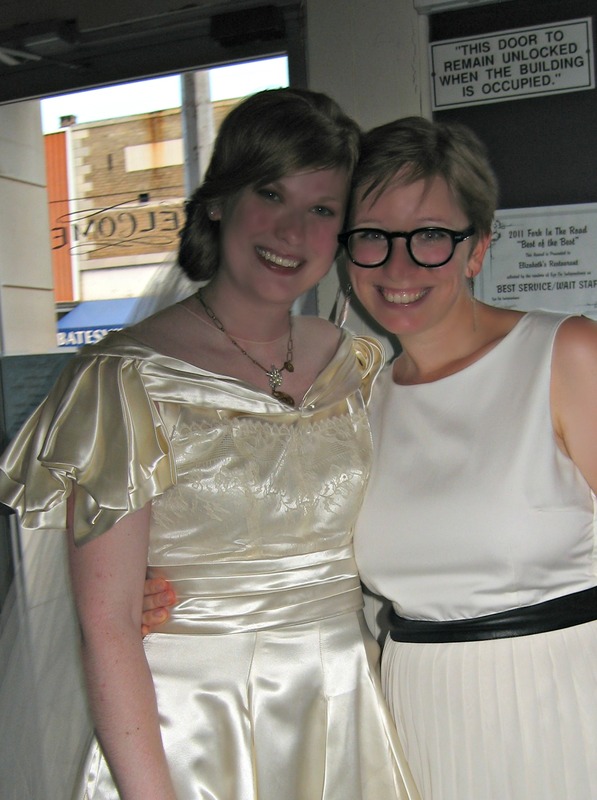 We all know the saying–a bride needs something borrowed, something blue, something old & something new– When my friends Caroline and David announced that they were engaged, shortly thereafter Caroline asked me to make the jewelry for her bridesmaids & herself. I’m not sure I can ever quite express how deeply honored I feel when asked to make wedding jewelry. It’s so important. It’s in the pictures you’ll have for years & for us gals, this is the outfit that we dream & scheme about for ages (more than half of the pins on Pinterest can attest to that!). The things I make come with little a lot of love–for the various pieces themselves and also for the enjoyment that afternoon (or more often, the wee hours of the night) have yielded. I truly enjoy what I do and on this occasion, it was pure bliss. I put more than a little love into this one–I put a piece of my heart. David & Caroline are both two good friends of mine and I wanted to make something special that she could have & wear long after their wedding. So I made her a necklace with a rare bit of Americana–an Art Deco W&H Co. Sweetheart Locket (which some of you may remember from a post from a few weeks ago). Caroline’s necklace is made entirely with vintage & antique pieces (her something old–apart from her stunning wedding dress & veil–her grandmother’s). The chain is a combination of vintage brass chain & an antique gold watch chain. The button pictured in the middle of the above collage is also from that same watch chain. Above the locket rests the remnants of a clip-on pearl & rhinestone silver earring. The locket, I hope, will keep her loved ones & husband close to her heart. I have a few more weddings coming up of friends & family (I know already that I am making more fabulous wedding accessories). And who knows, one day it might be my turn…I did catch the bouquet after all! There’s a Heart in Every Locket! 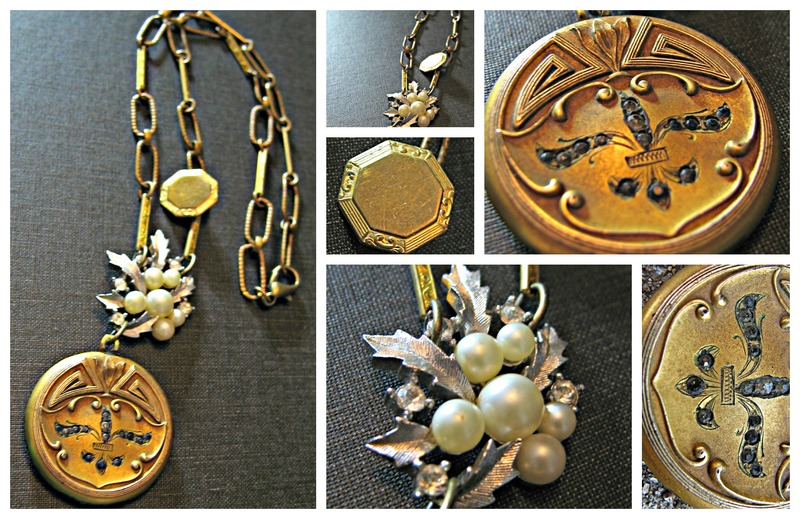 I love vintage & antique lockets! When I stumble across one at a flea market or estate sale I usually end up buying it. As jewelry, they are often intricate & beautiful and as nostalgic objects, they are both mysterious & romantic. I wonder what torrid love affairs the wearer had or unrequited loves they may have harbored. 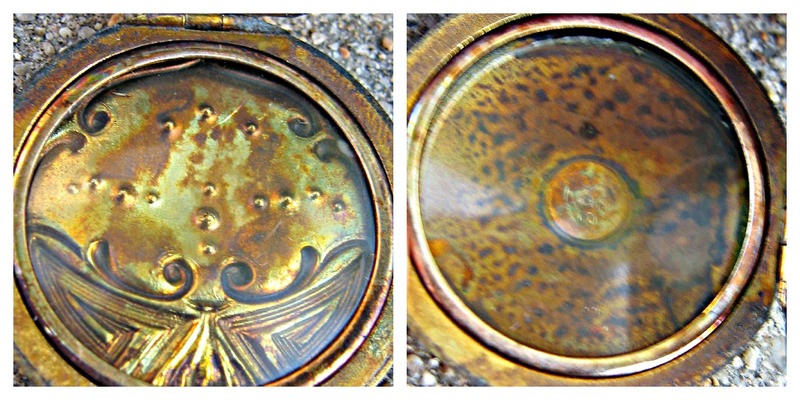 Lockets seem like they have secrets already inside. 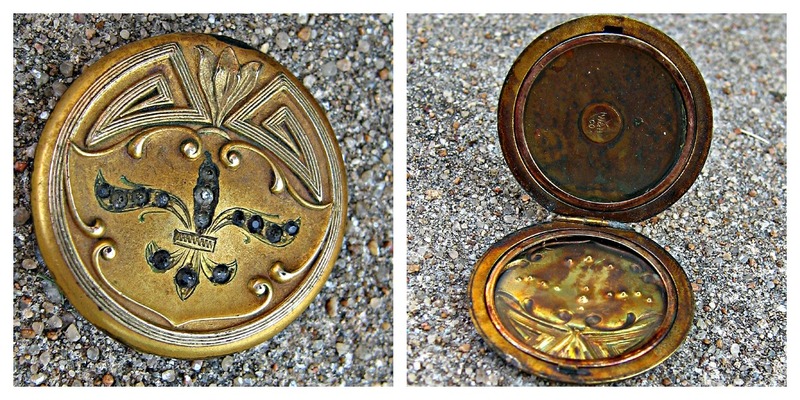 This particular locket came with a mystery–a trademark that eventually lead me to its history. I was able to track down information about W & H thanks to the New York Public Library’s digital archives of advertisements and a few skilled Ebay auctioneers. 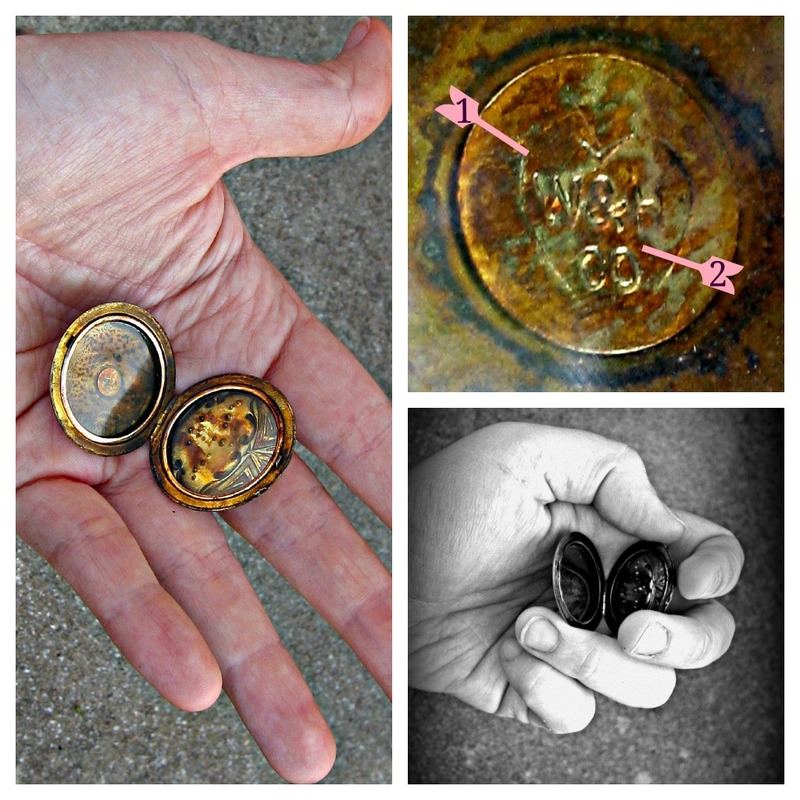 The trademark inside this locket, “W & H Co” (pictured below as 1) with a heart etched around it (pictured below as 2), belonged to Wightman & Hough Company who operated out of Providence, Rhode Island. 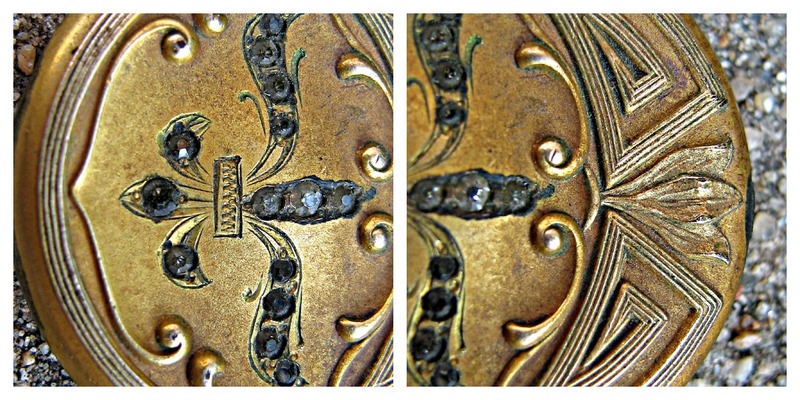 Though I do not know the exact date of this locket as of yet (sadly, I must wait a long while for an inter-library loan to come through for a jewelry catalog from 1910 to verify thestyle & date of this locket)–I believe it is from the latter period of W & H Co.’s production. The design on the locket is an Art Deco pattern and the stones (which are all in tact) are sapphires which were popular at that time. 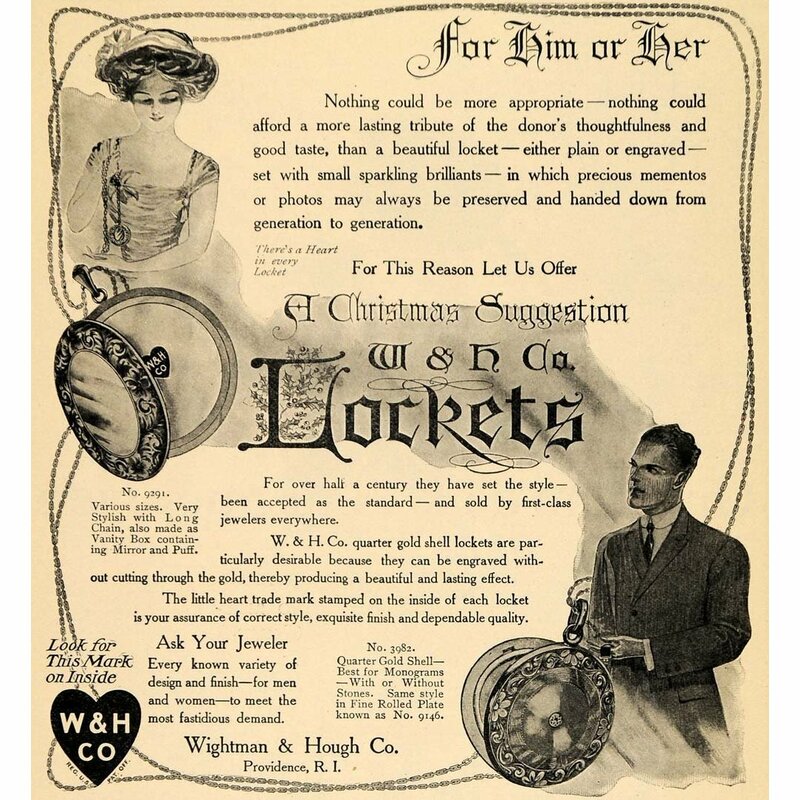 For now I know the approximate value of the locket is between $65.00-$250.00 (I paid $12.00 which makes me feel a bit like a Robber Baron). You never know what you will find & what it is worth until you do a little digging–sometimes you’ve gotta trust your gut! Happy Flea Marketing everyone!